Benefit performance for Grateful Crane Ensemble’s goodwill tour to Tohoku and Little Tokyo Koban. “Nihonmachi: The Place to Be,” the Grateful Crane Ensemble’s musical journey about Japantown as told through the eyes of three generations of a local manju-making family, will be returning to Los Angeles on Saturday, June 23, at 2 p.m. at the Aratani Theatre in the heart of Little Tokyo. Proceeds from this one-show-only performance will benefit Grateful Crane’s 2018 Goodwill Tour to Tohoku and the Little Tokyo Koban. 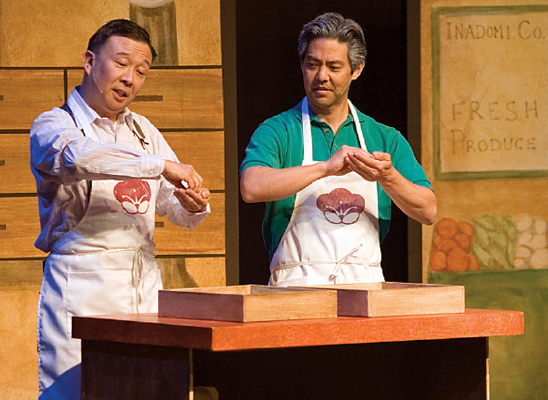 Presented by Grateful Crane and the Little Tokyo Public Safety Association, “Nihonmachi: The Place to Be” tells the fictional story of Alan Iwata, a burned-out Sansei manju maker who is shutting down his family business after 99 years. But just before he closes his doors for good, the spirit of his Issei grandfather returns and takes Alan on a journey back some 77 years to Nihonmachi the way it used to be. First performed over ten years ago in Japantowns in San Francisco, San Jose and Los Angeles, the show has evolved over the years but has remained relevant, especially given the changes currently happening in Little Tokyo. Written by Kashiwagi and directed by Darrell Kunitomi (also a cast member), with musical direction by Scott Nagatani, the two-act musical follows a Japanese American family through the Great Depression, the war years in camp, resettlement after camp, redevelopment in the ’50s and ’60s, the Asian American movement of the ’70s and the redress movement in the ’80s. The show also features classic Japanese and American songs interspersed throughout. “All of the songs will trigger fond memories and will take our community back to a special time and place in their lives,” said Kashiwagi. “For the Nisei, the Japanese songs especially will bring back memories of their Issei parents. The cast includes Kerry Carnahan, Loryce Hashimoto, Yoko Ibuki, Keiko Kawashima, Kurt Kuniyoshi, Merv Maruyama and Helen H. Ota. Musicians are Nagatani on piano, Danny Yamamoto (of Hiroshima) on drums and taiko, Gordon Bash on bass. The Aratani Theatre is located at 244 S. San Pedro St. in Downtown Los Angeles. Tickets range from $60 (premium orchestra), $40 (orchestra), and $30 (balcony). Tickets are $30 seniors, students and groups of ten or more. For questions and reservations, call the Grateful Crane ticket line at (310) 995-5841 or the Aratani Theatre Box Office at (213) 680-3700.